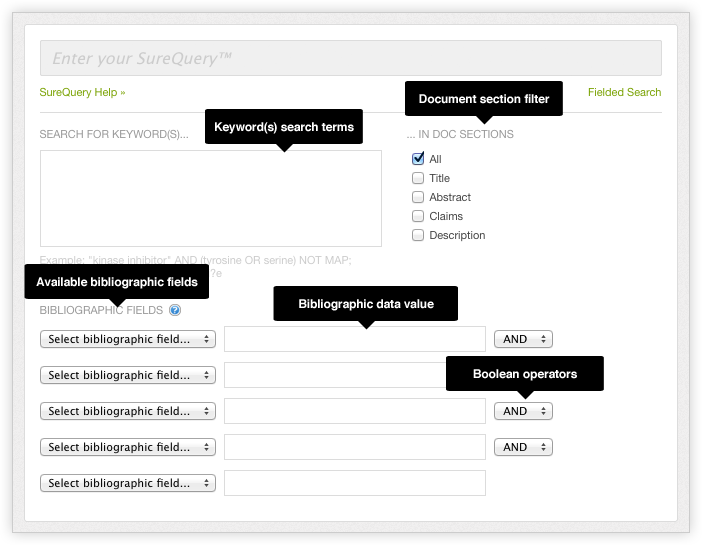 Field search allows you to search specific parts of patent documents without learning a complicated query language. Keyword(s) Search Terms A full text field in which you provide terms or phrases combined with Boolean operators for searching in the specified document section(s). Note: See Lucene Query Parser Details for definitions of Terms and Phrases within search fields. Document Section Filter A mechanism for selecting the specific part of the document in which to search for the specified keywords. Note: The query is the combination of your keyword term AND your bibliographic field search. Available Bibliographic Fields All the bibliographic fields against which the system may search. Bibliographic Data Value The term for which SureChEMBL searches in the related bibliographic field.